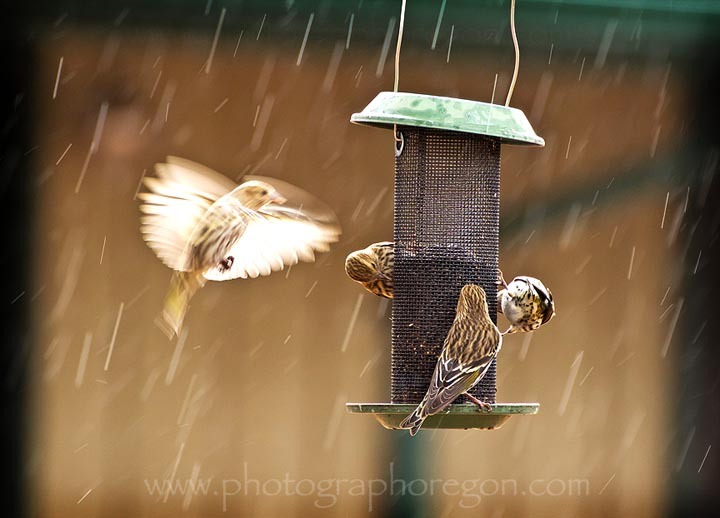 Wednesday February birding for 2012 East Cascades Audubon Society was filled with fun birds for everyone. We started off with a hunt for the elusive reported White-winged Crossbills and the Common Redpolls. We headed up Skyliner Rd to Forest Rd 430 to see if we could find them. 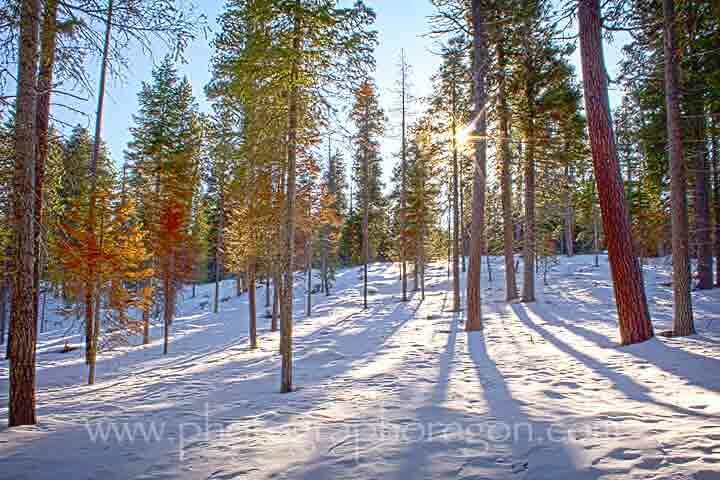 I was still recovering from a bad fall on the ice where I smacked my knee but didn’t break my camera (WHEW). We tromped and pished and tromped and pished and saw no White-winged Crossbills or Common Redpolls. However, for me, the day was amazing. 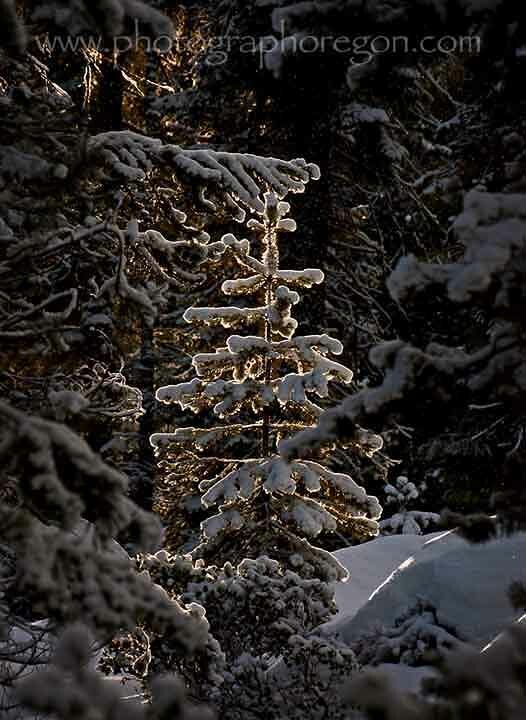 The light was stunning, magical, often breaking through and just illuminating one tree like this one. The colors of the forest were breathtaking. 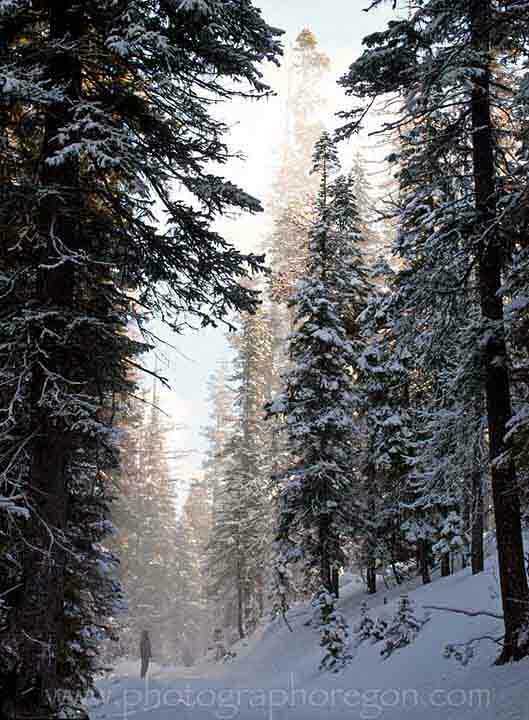 There is little snow down in town, so it was like being in a magical fairy forest. We were on forest Rd 430 that goes up to the OMSI camp. After a full trek and no birds we pished up a few Nuthatches and while I was looking for them I manages to pick off a life bird. 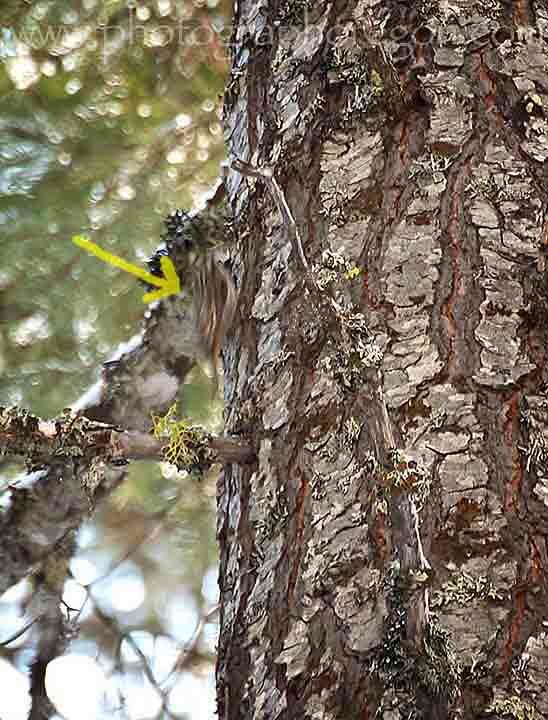 A little Brown Creeper scurried up a tree. It was so fast that this is a blurry shot of it, but the only one I got. FYI I think they should be renamed "Brown Racers". 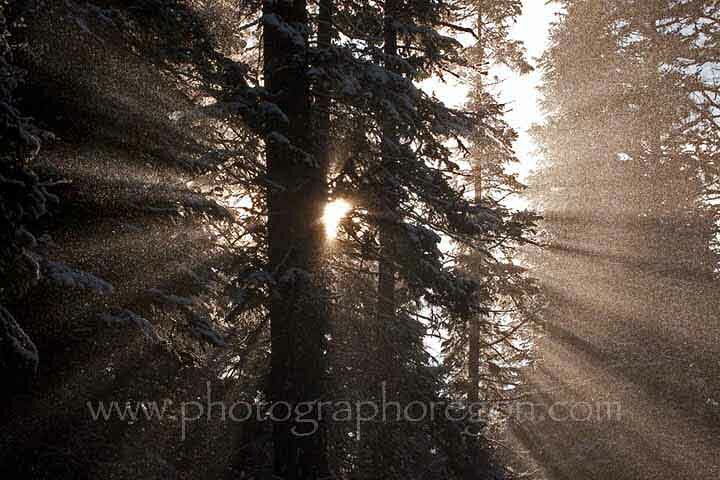 Then…Judy said “LOOK AT THAT!” I turned to see the snow blowing through the sunbeams spread out behind a tree. It was breathtaking and all gone in three shots. All in all it was a really lovely day. Birds or no birds. The die-hard birders might have been a little disappointed, but this girl was enthralled. Wednesday February Birding might be off to a slow start but February Wednesday Birding photography is rolling! Our Wednesday February birding on the 8th was just two of us. Judy and I, good for me since Judy knows her stuff! 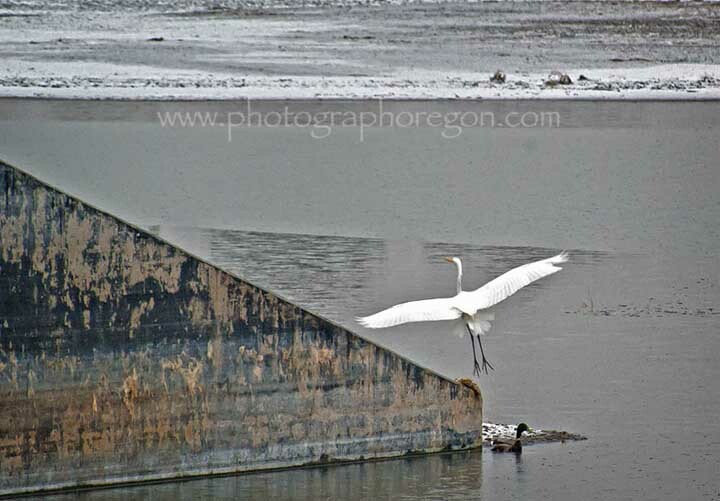 We jumped in the old faithful Subaru (The state car of Oregon) and headed off to the Redmond Sewer ponds where we found this lovely Great Egret. We moved on to the Redmond golf course where we spotted the Eurasian Wigeon duck hiding out in a pack of American Wigeons. Two life birds for me so far today! From there we moved our February Wednesday birding to White Rock Loop where we spotted a cool Great Blue Heron hanging out on top of an old barn. I was happy enough with the cool barn. The bird was icing. We also checked out Tetherow Crossing and Twin Bridges but it was cold and grumpy and the birdies were hunkered down. I was lucky enough this day to walk in the footsteps (literally…he has big feet) of Kevin Smith. 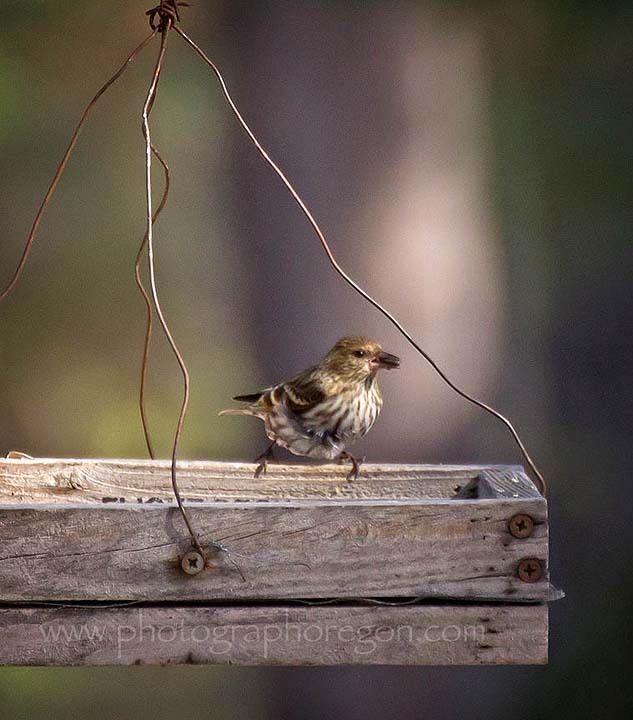 He was kind enough to give me tips on getting better bird photos. It was my second day with my new camera and so I got to look super dumb because I didn’t know where a lot of stuff was. Still we had a great time. 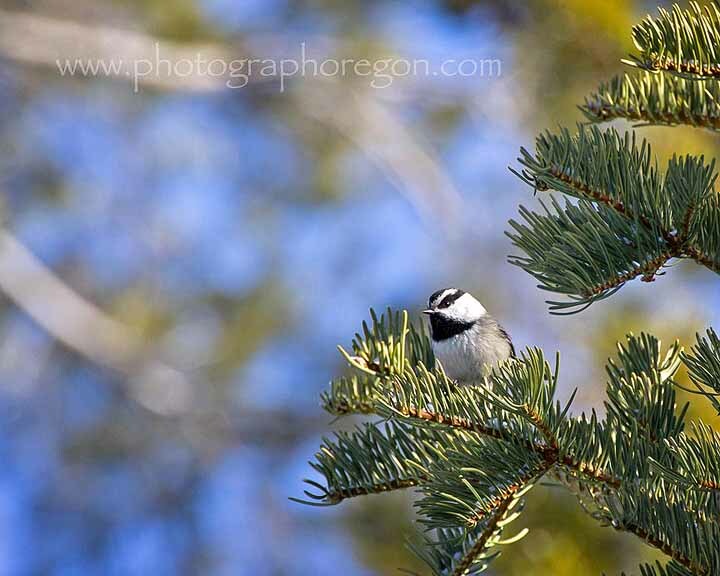 We found some adorable Mountain Chickadees and my new camera performed nicely. This is the best shot I have ever gotten (so far) of a chickadee. 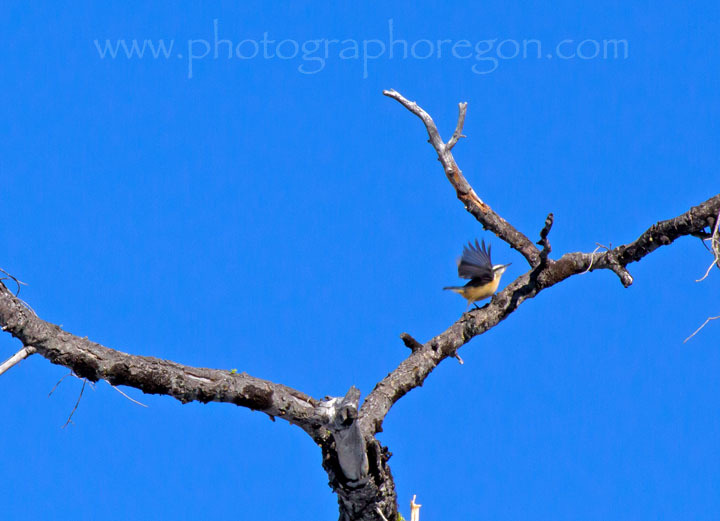 I am still at the stage of birding where I find them and nuthatches charming. 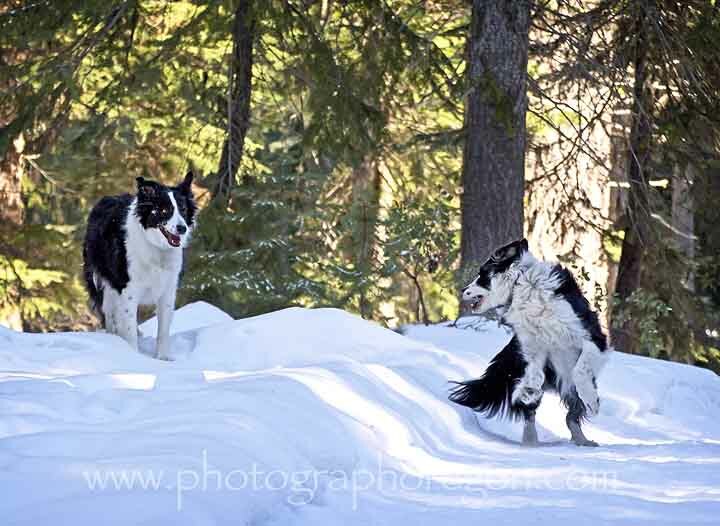 While we were out on the trail we ran into Steve and his pooches. They were having so much fun playing in the snow how could I resist a few pictures? Steve invited us to come check out his bird feeders because there had been a Blue Jay (Not a scrub jay a real blue jay) hanging out. They are rare here in Oregon so we all piled in the cars and headed over. 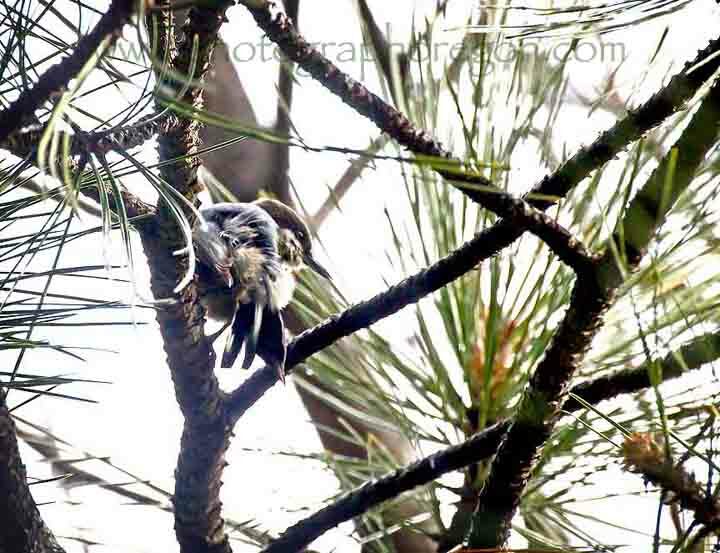 We didn’t see the jay but there were some Pine Siskins having a nice feed. There were some Cassin’s Finches there as well but I didn’t get any decent shots of them. 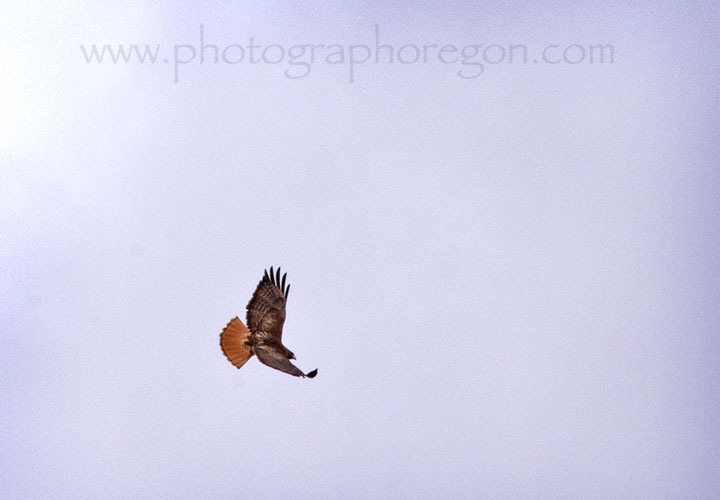 A golden eagle was soaring above us. Really sweet. 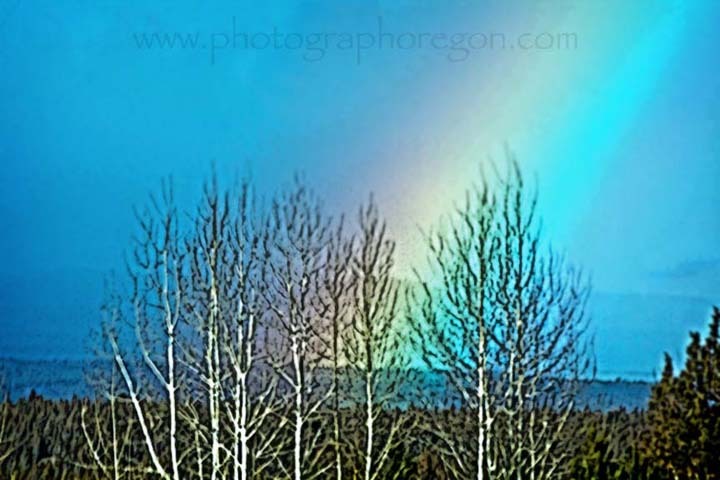 This Wednesday February birding day started off with a brilliant rainbow as we drove in to Sisters, Oregon. I pegged it as a good omen. For a while it looked like I made a mistake on that one. …and some Pygmy Nuthatches, who were making the most of the rain and bathing. We went to the forest in Sisters to the burn area looking for woodpeckers and struck out and then on to the hotel that has feeders and struck out there too. It started to rain harder. The prospects were getting bleaker. We decided (we being Howard) to go down to Lower Bridge. (Did I mention Howard is a genius?) There were birds galore! 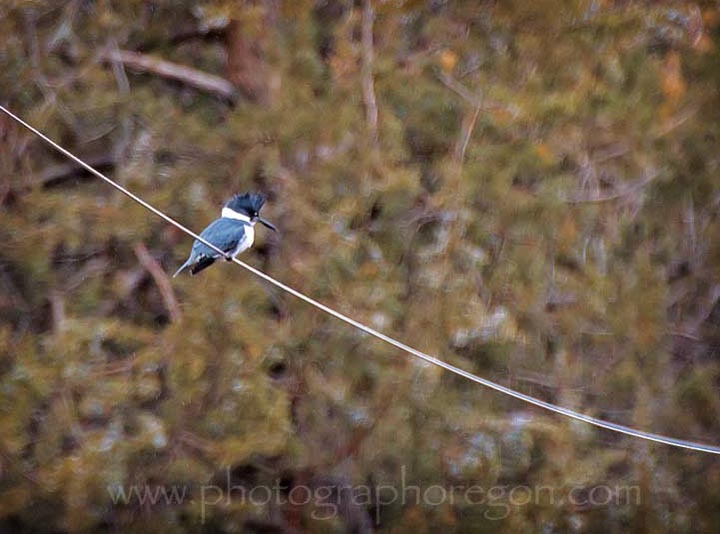 As we pulled up there was a lovely little Belted Kingfisher hanging out above the river on a wire. 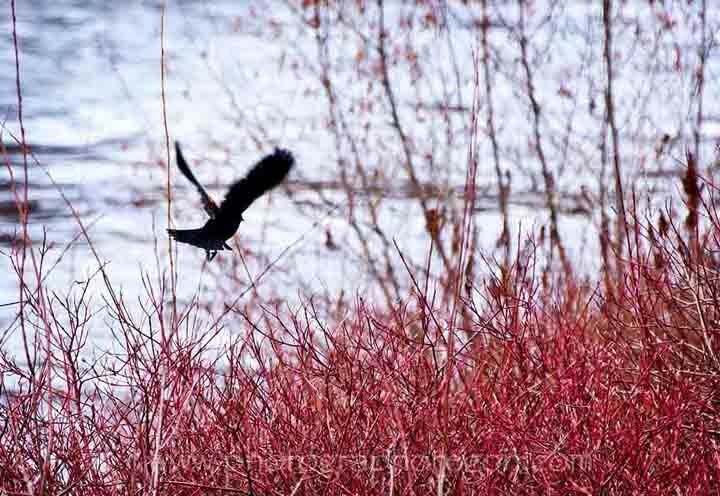 The river reeds were full of Red-Winged Blackbirds flying around. For many of us this was the first of spring (FOS) spotting. I had seen one at my feeder the day before so not for me but exciting. They photographed so well against the red reeds. 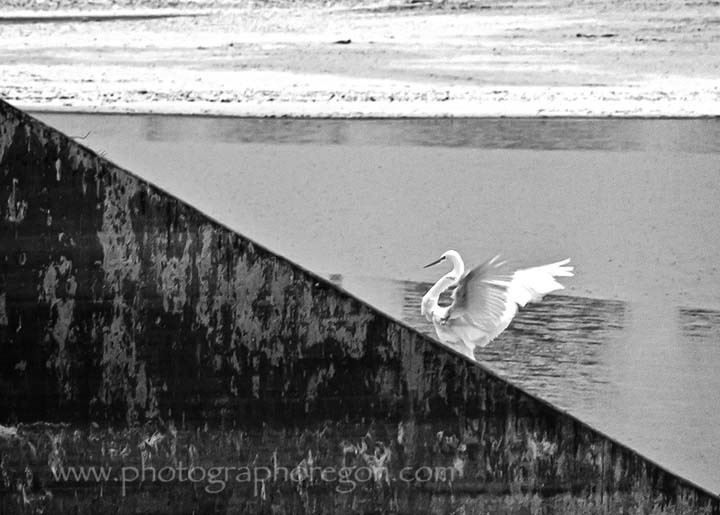 There were several Great Blue Herons flying around the river making the best of the sunshine that had now come out. 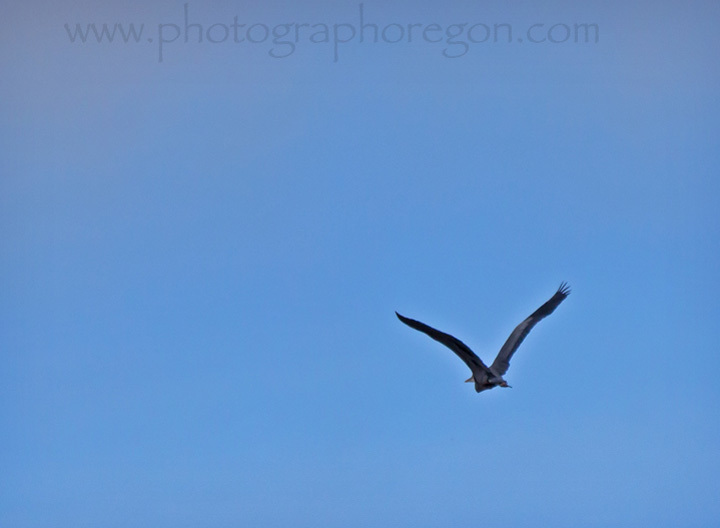 There were also hawks soaring in the lovely blue skies. 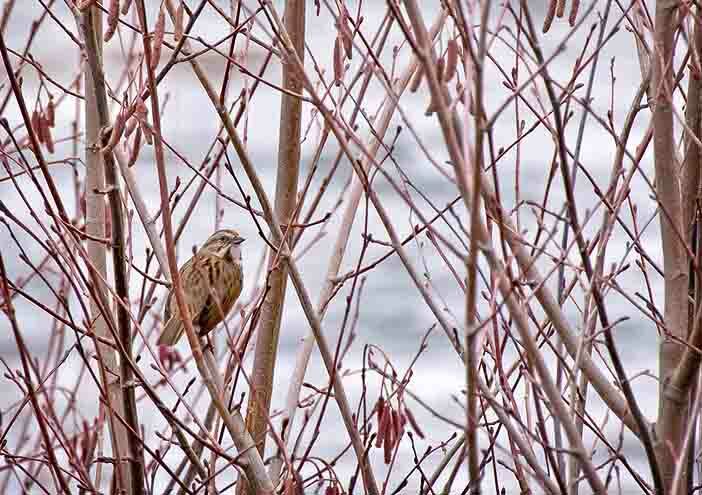 The reeds were also full of Song Sparrows singing away. 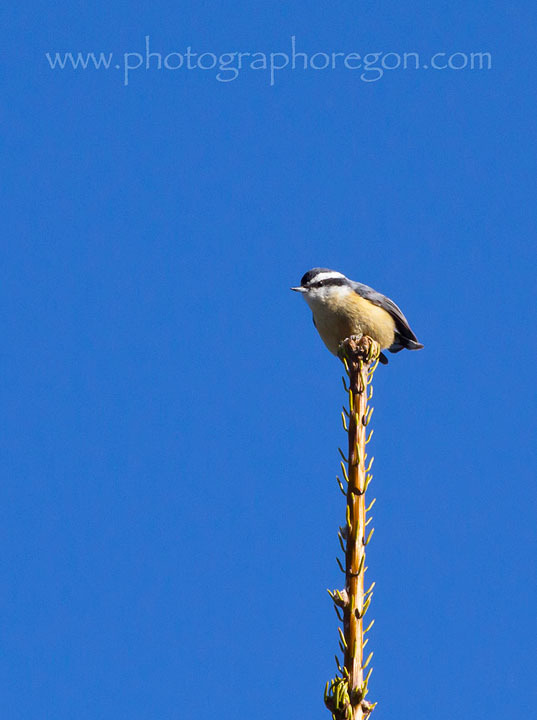 This one was unafraid and stood on a branch right in front of me and sang away. 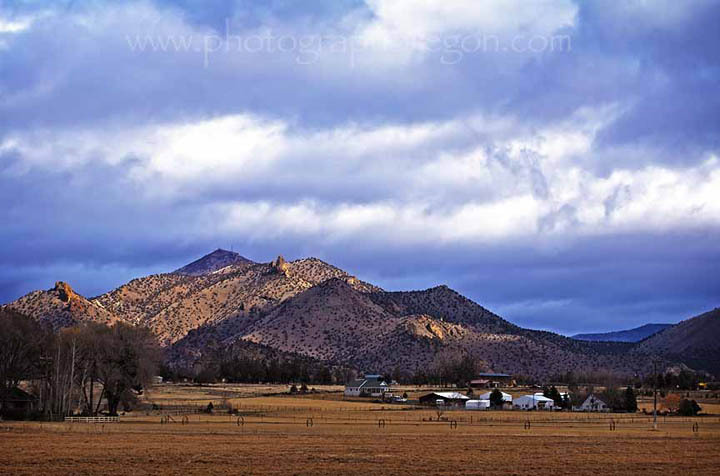 On our way out we stopped where there was a field that the hawks fly in and the light that was playing on and off of Smith Rock was lovely. A really nice end to a day that turned out to be really good after all. Snow was dumping and ODOT advised only going out for urgent circumstances. Even though we consider birding urgent…we abided...no Wednesday February birding.